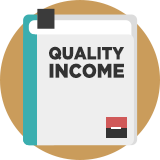 Quality Income is a dividend strategy focused on firms with strong fundamentals and high yields, based on research by Societe Generale. It looks for quality income stocks using checklists for identifying strong financial health, low bankruptcy risk and high, but not excessive, yields. Specifically, firms must be capitalised at more than £800 million, have a Piotroski F-Score of more than 7 out of 9 and a strong Altman Z-Score. Yields are capped at 15% to avoid potential dividend traps.The SocGen team explains: "As a real asset class, we think Quality Income is an attractive alternative to anyone buying credit thinking that’s the only way to generate a high yield." SocGen found that quality income stocks produced standout total returns that averaged 11.6% per year since between 1990 and 2012, more than doubling the return of the global equity markets but with significantly reduced volatility. In this paper the Societe Generale Global Equity team illustrate that 'Quality Income' stocks have a tendency to enormously outperform both Quality stocks and High Yielding stocks.